WARMTH is a hot topic of debate. As the sun delivers its warmth and its light in the same package, it can be confusing which more affects plant growth. The shorter answer is: daylight. The longer answer is: before pondering growth, we logically first must examine germination, because germination and growth are two distinct stages that raise two separate issues. Generally (which means, with many exceptions), germination does not require light, but does require warmth. Seeds that do not need warm receptions include peas, celery, and most lettuces. The warmth that most seeds do need is commonly called room temperature, around 70 degrees F (21 degrees C) during the day, though somewhat lower than that during the night. 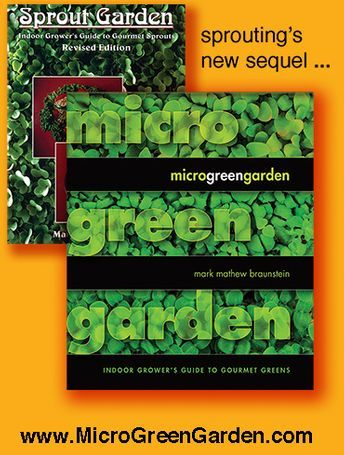 Outer limits for all seeds for microgreens range from 50 degrees F (10 degrees C) to 85 degrees F (29 degrees C). Thus even indoors, summers can be too hot and winters can get too cold. During winter, if you keep your home frigid, you can encourage seeds to germinate by moving them near a radiator or heater, or by placing a seedling heating mat under the containers of seedlings. Designed specifically for this purpose, the mat’s low wattage will not melt the plastic containers. But, and here comes a big BUT, beware the possible perils of PET recycle number 1, of which most fruit containers and seedling pots are made. Heat might cause its plasticizer to migrate into the soil. So disregard the instructions that accompany seedling heat mats, whose manufacturers are neglectful of this issue. Do not place plastic containers in direct contact with the mat. Instead, if your kitchen cabinets are made of metal, you can affix seedling heating mats to a cabinet’s inner walls to create a “germinarium.” Lacking a metal cabinet, you can construct a germination terrarium inside a glass fish tank with an aluminum top, minus the water and minus the fish. If you shop for a glass fish tank at a pet store, there too you can purchase reptile heating mats, whose heat output are of the same low wattage as seedling mats. Reptile heating mats differ in that they come with the addition of adhesive to their backs, ideal for affixing the mats to the walls of your metal cabinets or glass germinariums. Having affixed both a seedling heating mat and a reptile heating mat to the inner walls of a metal cabinet and constantly used them from fall through spring for over twenty years, I can attest that both work well and last long. In the winter, when my kitchen nighttime temperature descends to 60 degrees F (15 degrees C) or less, the cabinet interior remains 70 degrees F (22 degrees C) or more. This setup enables me both to germinate microgreens and to grow sprouts even in the dead of winter, thereby making my winters quite live. GERMINATION times vary widely from species to species, but for seeds commonly regarded as suitable for microgreens you can count on less than one week. Often, you can discount the time listed on the gardening company catalog page or seed packet. For instance, if 1-2 weeks is stated, do not be surprised if only 1-2 days are required. Or if 2-3 weeks is stated, you might need only 2-3 days. Huh? Two factors contribute to this disparity between their forecasts and your results. First, by not burying the seed under soil, you reduce its workday by eliminating its long commute. Secondly, you are pampering the seed with more consistent warmth indoors than the fluctuating and frigid conditions it might be dealt by the cruel outside world. Once germinated, most seedlings can thrive despite fluctuations from 60 to 80 degrees F (15 to 27 C). Lettuce, dill, onion, peas, and most Brassicas actually flourish at 60 degrees F, so are ideal fall or winter crops for your side of the windowsill. Indeed, red pac choi’s leaves gain tinges of red, and purple turnip’s stems stain purple, only with exposure to relative cold. 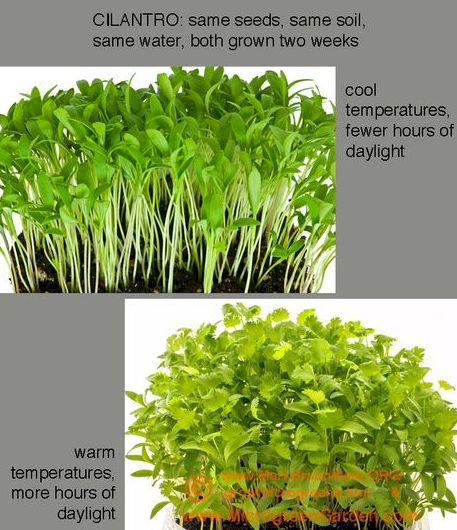 Non-Brassicas, however, that grow to harvest length in summer in one week can take up to two weeks during the colder days and shorter daylight hours of winter. And at 60 to 65 F (15 to 18 C), still other microgreens such as basil dig in their heels and refuse to budge an inch. These you simply can postpone growing until spring. Outdoor gardeners sow seeds beneath a layer of soil to protect them from burning sun and blowing wind and pecking birds, while the darkness underground is mostly incidental. Some seeds, for instance onion, beets and chard, germinate sooner and at higher ratios under the cloak of darkness. Other seeds, for instance celery, chervil, mint, some basils (which actually are mints), and most lettuces, especially head lettuce, require exposure to light to spark germination. If under contrary conditions, seeds still germinate, but with some delay or at lower ratios. Most seeds for microgreens are not fussy and will germinate equally well in daylight as in darkness, so nearly all microgreens are created equally. This one shared trait is universal: once germinated, all microgreens seek the light.